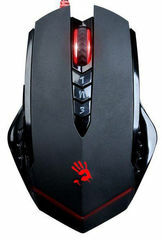 Bloody Multi-Core Gaming Mouse VM Series offer a wide assortment in shape and size according to individual player's needs, so as to increase the operating stability and best fit for in-game control! Exclusive - Metal X'Glide Armor Boot is frictionless, durable and wear-resistant. The smooth surface enhancement glides 20% faster and last more than 300Km of travelled usage. Exclusive "Ahead" Technology reduces key response time to 1ms (normal time for others is 18ms). Exclusive-Resolves "Over-Clicking" malfunction. Greatly improves key-switch life span. Exclusive-3 shooting Modes in Left Button-Use "1, N, 3" keys to shift the left button with 3 shooting modes., e.g. "single shot, 2x shot, and 3-burst shot” to boost up the firepower for the best funs performance. 8 Programmable Buttons- adequate for playing FPS shooting games with 3 shooting modes in left button. Exclusive "Ahead" technology reduces key response time to 1ms (normal time for others is 18ms). It significantly reduces the key response time stay ahead of your enemies in game play! (Applicable only in Ultra Core3 mode-optional to be purchased separately) Download “Mouse Click Speed Response” software here and see it for yourself! * Resolves “Over-Clicking” malfunction, greatly prolong mouse button's life span. Exclusive Ultra Gun3 offers 3 shooting modes shifted by "1, N, 3" keys to boost up firepower for the best firearms performance! From time to time, Ultra-Core software/firmware can be upgrade to keep the product in the latest edition and best-tuned condition. Built-in 160K bit memory allows user to save as many as 4000 command lines and perform macros to the max! Diezgan dīvaina formā, bet ātri pierod. Качество сборки и сенсор очень хорошие. Чтобы работали некоторые геймерские функции их вроде надо купить через сайт и активизировать, но мне они пока не нужны. Manuprāt šī ir perfekta budžeta pelīte, kas īpaši domāta spēlēm. Man ļoti patīk. Laba pele, nesmird pēc ķīniešu plastmasas, ērts malas pogu izvietojums.